Duluth, Minn. & Knoxville, Tenn. (21 February 2018) – Cirrus Aircraft announced today that new customer aircraft deliveries for the company’s best-selling SR Series soared to over 350 aircraft in 2017, a recent record high. As the global SR Series fleet approaches 10 million flight hours in over 60 countries, the company has also ramped up production of its turbine aircraft – the world’s first single-engine Personal Jet™, the SF50 Vision® Jet – with 25 Vision Jets currently delivered and in service around the world. The past year marks the fourth consecutive year that Cirrus Aircraft has delivered more than 300 SR Series aircraft. Enterprise growth also propelled facilities expansion and employee growth across all Cirrus locations in Duluth, Minnesota, Grand Forks, North Dakota and Knoxville, Tennessee with nearly 300 jobs added in total over the last year. Included in the expansion is the Knoxville-based Vision Center campus, which will open the doors to its new world-class Cirrus Approach™ training center later this year. The new training center will include a Level D full-motion Vision Jet simulator for the most advanced Cirrus transition training in the world. Cirrus Aircraft’s first high-performance SR airplane – an SR20 – was delivered in 1999 and transformed general aviation with intuitive avionics, game-changing performance and revolutionary safety systems, including the Cirrus Airframe Parachute System® (CAPS®). Today’s SR Series aircraft include the SR20, SR22 and turbocharged SR22T. And a new company milestone is just ahead as Cirrus will deliver its 7,000th SR airplane in April 2018. Now in its sixth generation, the SR Series has been the best-selling general aviation piston aircraft in its class for sixteen consecutive years. 2017 marked the launch of the enhanced G6 SR Series with the Cirrus Perspective+™ by Garmin® flight deck which includes expanded avionics and flight planning options, luxury automotive-inspired Cirrus Spectra™ wingtip lighting, cockpit connectivity solutions and premium interior options. In 2016, Cirrus Aircraft ushered in a new era in personal transportation with the FAA certification of the world’s first single-engine Personal Jet – the Vision Jet. The turbine aircraft defines a new category in aviation – the Personal Jet – with its spacious, pilot and passenger-friendly cabin featuring panoramic windows, reclining seats and comfortable legroom to accommodate five adults and two children. The cabin is complemented by the proprietary Cirrus Perspective® Touch™ by Garmin®, which delivers a wide array of sophisticated and intuitive global navigation capabilities and safety features at the touch of a finger. The Vision Jet has won widespread industry accolades, including Plane & Pilot’s 2017 Plane of the Year as well as Popular Science’s 2017 Best of What’s New. The company has delivered 25 Vision Jets to customers since certification in late 2016, with owners enjoying the added value of a truly comprehensive ownership program, JetStream. Designed to enhance the Vision Jet through “worry-free” ownership, JetStream includes the award-winning Williams International TAP Blue turbine engine coverage, airframe and avionics maintenance, normal wear item replacement, premium recurrent pilot training and more. Recognized in 2016 as the first recipient of the Joseph T. Nall Safety Award from the Aircraft Owners and Pilots Association (AOPA), Cirrus Aircraft continues to transform pilot training and safety with Cirrus Approach™. As a comprehensive program, Cirrus Approach provides ongoing training to new and experienced pilots with their lifestyle in mind through award-winning in person and online training courses. More than 12,000 pilots and owners have joined the program and 2018 will bring further expansion and continued industry-leading initiatives. In addition to Cirrus Approach, the company also launched Cirrus Embark™ in 2017, a unique program designed specifically for owners of Pre-Owned Cirrus Aircraft. This revolutionary program provides Cirrus-specific, standardized differences and transition training for a licensed pilot who purchases a pre-owned Cirrus Aircraft. Included in the program is access to the Cirrus Approach Learning Portal, a copy of the Cirrus FOM and aircraft POH, access to the iFOM and one-on-one Cirrus Transition Training with an authorized Cirrus training provider. More than 500 new owners of pre-owned Cirrus Aircraft have already taken advantage of the program since its launch in July of 2017. Professional flight training organizations continue to grow their fleets with the technologically advanced, industry-leading SR Series aircraft as they prepare the much sought after next generation of pilots for a career in aviation. Two of the largest global airlines, Lufthansa and Emirates, added fleets of the SR Series aircraft to their training programs in 2017. While other world-renowned flight training academies, including Japan Civil Aviation College, Southern Utah University and Vincennes University, purchased new SR training fleets from Cirrus. In addition, the Cirrus Perception™ – the company’s sensor-capable special mission aircraft – continues to enhance law enforcement search and rescue efforts. Ideal for a broad range of law enforcement and civilian survey missions, the Minnesota State Patrol recently used its Cirrus Perception aircraft to monitor the skies during the big game in Minneapolis. 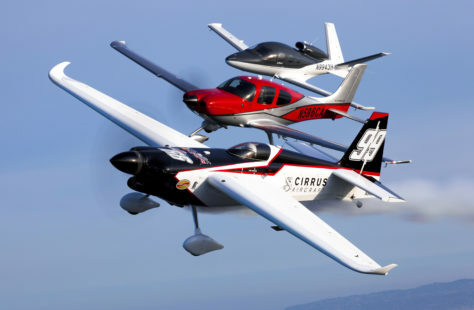 For the fifth consecutive year, Cirrus Aircraft will have an international presence in the Red Bull Air Race World Championships as a sponsor of Team 99 and U.S. Master Class Pilot, Mike Goulian. After a strong performance in the 2017 Championships, Mike set a career record and took home the gold by winning the Red Bull Air Race season opener in Abu Dhabi on February 3, 2018. Goulian, a Cirrus Ambassador, owner and pilot, joined Red Bull Air Race in 2006 and won his first victory at the Budapest race in 2009. The Red Bull Air Race World Championship has become globally renowned as the fastest and most exhilarating motorsport on the planet, and Goulian’s stellar win in Abu Dhabi sets the team up for a fantastic 2018 race year.